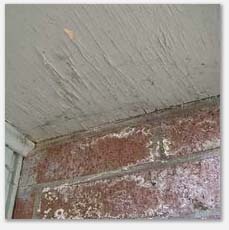 Efflorescence is a white mineral deposit left behind from water penetrating masonry. Note in this picture efflorescence on the bricks and peeling of the paint on the soffits. This chimney was found to have deteriorated counter flashing and a failed chimney crown. Water damage was inevitable. Any time that water is in contact with wood, there is a significant chance of wood destroying organisms (ants, termites and wood boring beetles). In the Puget Sound area all our structural pests are related to high moisture content. The best practice in our area is to keep all wood surfaces properly painted and dry. Excessive moisture is a conducive condition for wood destroying organisms.